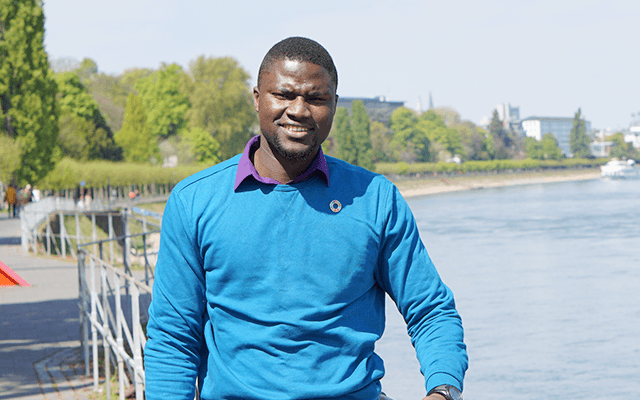 Tosin Orenaike, 29, from Nigeria, is a first year student in the UNU-EHS and University of Bonn International Joint MSc Programme “Geography of Environmental Risks and Human Security”. Here he shares his thoughts on his new home city, the course and his future plans. Tell us a little bit about your life before Bonn. After studying Geography at the OAU [Obafemi Awolowo University in Ile-Ife, Nigeria], I worked with the National Emergency Management Agency, as an Emergency Management Vanguard. Since this is the agency responsible for disaster prevention, preparedness, mitigation and response in Nigeria, it was a great experience. What’s more, this was at the time when we had an Ebola outbreak in Nigeria, so part of my responsibilities was to visit schools, educate and sensitize the locals on how to keep themselves safe from the virus. I also worked gained experience in the private sector, as a mapping specialist for a mining company. Here, I would assess remote areas for their mining potentials such as, such as tin and columbites, while also monitoring the productivity of existing mineral sites. Why did you choose to apply to the UNU-EHS joint Master’s programme ? After graduating from OAU, I knew I didn’t want to go straight into postgraduate study. But then after gaining work experience I knew that I didn’t just want to return to the classroom. So I looked at institutions across Europe and America, and then UNU-EHS was recommended to me. I was impressed by the fact that it’s not just theory – I have had enough of that! Rather, the focus is on both: carrying out research and then implementing it, and this combination of theory and practice really appealed to me. At the same time, I was also impressed by the course leaders, who are all experts in their fields. What have you liked most about the programme so far? The great mix of theory and practice has so far been exciting; I have really been impressed by the diversity of the students. I am studying alongside people from all over the world – from Italy, Mexico, Brazil, the U.S., for instance. What’s more, many of them, like me, have experience outside of academia, and some are even experts in special fields of disaster management, so we get to learn from them. This diversity also means that we come to look at our work from different cultural perspectives. Now I know the importance of taking different views or ways of approaching things as well as taking these into account before taking action – something that will be useful in my future career. How have you adjusted to life in Bonn? Swapping Lagos for Bonn was a big shock. The biggest first impression was how spacious everything is here, and how easy it is to get around. In Lagos I would sometimes have to get up and leave the house at 5am, if not earlier, because I could be stuck in traffic for hours. Here, it is much calmer, and you can easily get around on foot, by bike or by tram. What are your plans for life after UNU-EHS? After the Master’s course, if I do not choose to carry on my studies and embark on a PhD, then I would like to pursue a career in disaster risk management or vulnerability assessment, with an emphasis on flooding and drought. While I would love to focus on Africa, I will go wherever my knowledge might be needed. Tosin is a co-editor of the UN University student journal Peace and Progress.